Candlelit dinners, boxes of chocolates, and bouquets of flowers all spell romance for your human beau, on the other hand, these testaments of love could be dangerous to your favorite furry Valentine. 911 Vets proudly serves the Greater Los Angeles area with our mobile vet clinic. We offer all the traditional veterinary care services, however instead of you coming to our clinic, we bring the clinic to you! Whether it’s an emergency or your furball just needs a simple pet exam, our mobile vet clinic will come to you! View our extensive list of services and call 911 Vets today! 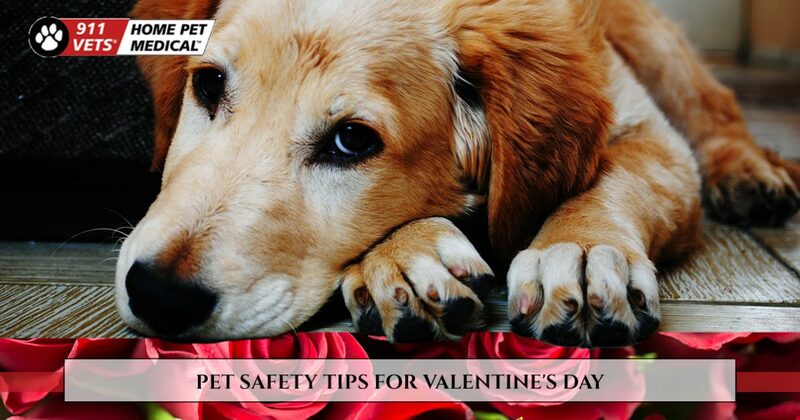 It’s important to be aware of the common dangers your pet may face on a daily basis, but on Valentine’s Day you may be exposing your pet to more safety issues than you realize. Continue reading below for a few things to keep in mind while you celebrate Valentine’s Day with your loved ones, and if your pet should eat something harmful, be sure to call 911 Vets immediately. Chocolate is most likely one of the first things you think of when it comes to harmful substances for your pet. While you may indulge in the decadence, your pet should not. Chocolate may be fatal, especially if it’s dark and bitter, as this will cause your dog or cat to eat more. Milk chocolate also has a higher fat content, meaning if your pet consumes a large amount, it could lead to life-threatening inflammation to the pancreas. That being said, if you decide to eat chocolate this Valentine’s Day, make sure you keep it in a safe place where your pet can’t reach it. Flowers are another popular symbol of love on Valentine’s Day, and your pet may love the sweet scent of the bouquet as much as you do! Certain plants and flowers are poisonous to your pooch or furry feline, but they may be tempted to taste anyway. Lilies are especially toxic to cats. If you’re sending a bouquet of flowers to someone with a cat, be sure to specify no lilies when you send in the order. Upon receiving flowers, take note of any that may be poisonous to your pets and remove them. Your bouquet may not be as pretty, but your pets will thank you. For those who plan to stay at home on Valentine’s Day, a candlelit dinner might be on the menu. Candles construct an aura of romance and you may use them to create ambiance for your romantic evening. However, if you have curious pets, you may want to keep them out of the room if you have candles lit. The last thing you want is to have to call the fire department on Valentine’s Day because your pet knocked over a candle during his or her investigation. Roses for your sweetheart is a wonderful gesture on Valentine’s Day. Roses are not toxic to your pets, but if your dog or cat decides to take a closer look, they may run into some thorns. Puncture wounds can easily become infected, or even worse, your pet could accidentally swallow a thorn. Your best bet is to check roses for thorns and remove them as soon as your bouquet arrives. There may be many dangers for your pets this Valentine’s Day, but if you are aware of the hazards, it’s easy to keep your favorite furballs safe from harm. However, if your pet should eat something poisonous, call 911 Vets right away. Unlike traditional veterinary clinics, we offer a mobile vet clinic that will come to you! In addition to emergency services, we offer all the bells and whistles of your primary vet clinic. To learn more, check out our website, or contact 911 Vets at 310-341-0216 today!